Hello my name is Randy Hamilton and I traveled with my wife Sharon and 2 dogs, Jack and Jinjer, for over 4 years full-time in our 36′ 1998 Cruisemaster motor home. When I was first asked by Snowbirds to write an article about being Snowbirds I was caught a little off-guard. I never really thought of us as snowbirds per say, but just people who hated cold weather and drifted south until winter was over. Which come to find out, is EXACTLY what a snowbird is. 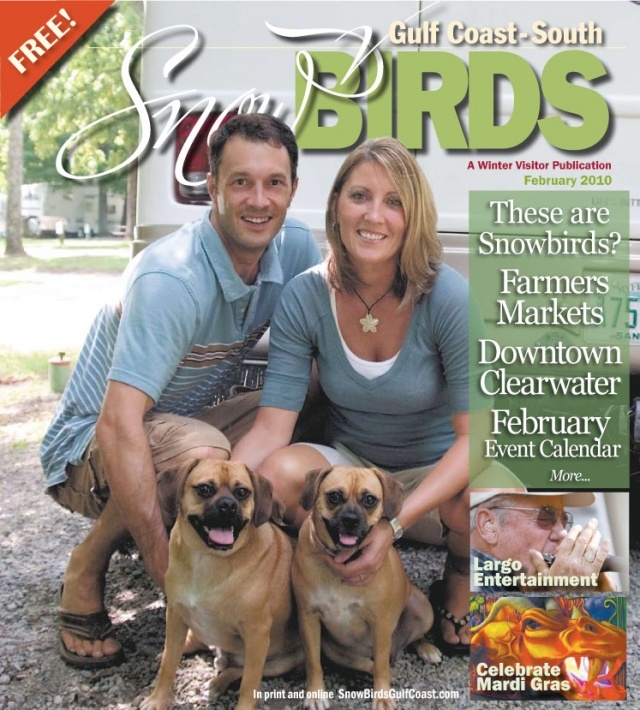 However, the fact that we were in our mid-thirties put us outside the typical age bracket for snowbirds. Our story started with losing our home on Pensacola Beach to Hurricane Ivan in 2004, and instead of seeing it as a setback, we viewed it as an opportunity to pursue a dream. We had always wanted to travel the U.S. in an RV, therefore we decided to purchase a motor home and hit the road. At first we just wandered around the Southeast occasionally venturing up to Ohio and Maryland to see family, eventually taking the plunge and trekking out to California. It was during the trips up north that we found out very quickly that our motor home was not equipped to deal with winter. At one point during a Christmas visit the water and sewer system froze up, we were unable to get anything in or out. Another lesson learned during that visit was that our motor home was poorly insulated for temperatures approaching 0 degrees. And while the propane heaters can keep it pretty warm in the coach, they can also drain a full propane tank in a matter of days which drains the wallet as well. We vowed right then and there to never again go through that torture. From that point on as soon as leaves started to fall we made our way south. We began our treks slowly southward usually around Thanksgiving, staying two weeks here and there before settling down around the Sarasota area. Orlando was always a scheduled stop on the way south as we love the theme parks. We had fallen for a sales presentation the first year and became Thousand Trails members. The system has a very nice T.T. property just outside Orlando in Clermont where occasionally we spent two weeks enjoying all that Orlando has to offer whenever we were near. Whoa! Immediately we pulled to the side of the road and I ran back to see small flames coming from the left wheel well of the tow dolly. I reached down and took handfuls of dirt and threw them on the fire to extinguish it. Apparently the electric brakes failed and engaged at some point and the friction caused the pads to overheat and burst into flames. I went back to the coach and Sharon asked me “Were we really on fire?” “Yep, we sure were. But we are not anymore” I answered with a slight chuckle. I proceeded to tell her what happened and we just waited some time for everything to cool down. Luckily we were stopped only a 100 yards or so from an exit that had both, an RV park and an RV dealership. Upon quickly setting up at the park I unloaded the jeep and jacked up the dolly to take the wheel off and get a better look. Everything was charred and any exposed wires were melted. At this point a man who was parked a few slots down from us come up and offered help. He was a retired bus mechanic and told me exactly the part I needed and he proceeded to help me that next day to install it and re-pack the bearings. We could not have been luckier than to have had our mishap anywhere other than there. Occurrences of people helping each other out in the RV community are very common. We found that it is a friendly and tight-knitted community where most everyone will lend a helping hand to their fellow traveler. We helped out and were helped out quite a bit during our journeys. And it was on another one of our southward treks that the most memorable and extraordinary, Good Samaritan, experience happened to us. Once again it was a brake problem, only with the Cruisemaster itself this time and not the dolly. We had just enjoyed a nice lunch in the coach at a rest area on I-75 and were ready to motor out. I placed my foot on the brake and put the coach in drive. When I released my foot off the brake we went nowhere. I pushed the gas and the engine revved. Still the coach was not budging. I put it back into park and once again put it into drive. Same thing. It was as if something was holding us from moving. I searched around the coach and saw nothing preventing the wheels from moving. I was stumped. I turned off the coach and started up my laptop to search the Internet for possible causes and solutions. I found a forum where a guy was answering questions for people who had motor home issues. It looked like he was actually online at that point. I submitted my question and he answered back with his phone number to call him, which I promptly did. He answered in a jolly voice and we exchanged introductions then we got to it. “Now explain in detail what is the problem is Randy” he politely asked. I began my detailed explanation of what was happening. Luckily he knew what was wrong. “The parking brake has engaged due to a broken pump switch.” The man then instructed me step-by-step how to go about disengaging the parking brake so I could continue on to our destination as well as the part number for a replacement switch. He even told me to call him back once we got the part so he could walk me through installing it and reengaging the parking brake. It was like having my own personal RV mechanic. We were so grateful for his help but he wanted nothing in return. What a wonderful individual! I am not sure what we would have done without him. He even called us back a few hours after we fixed it, to check and see if it was all in working order. Events and people like that can go a long way in restoring one’s faith in humanity. We eventually made it to our destination that winter which was the Sarasota area. While visiting we bounced around between Encore parks and private parks. One of our favorites to stay was the Holiday Cover Resort in Cortez near the coast. It was a small, but very friendly, place to call home for a bit. The proximity of Bradenton Beach enabled us to ride our bikes there in a matter of minutes. One place of note for us at Bradenton Beach was the Island Creperie. A small breakfast cafe located in the small downtown district on the beach. They had the best fresh crepes we have ever had still to this day. Bradenton Beach is a small quiet beach town with big charm and definitely a must-visit if you are staying in the Sarasota area. Another great place nearby is Fort DeSoto state park. Located a short drive north of Sarasota This is a fantastic place, but not for food, but rather for outdoors. There are wonderful bike paths and hiking trails. The beaches are un-crowded and there is even a section that allows dogs off-leash. We are dog parents so anywhere that allows dogs is a plus. Speaking of dog beaches, if you have a dog and like to take him or her to the beach, there is another great off-leash dog beach located just south of Venice Beach, by the Venice Municipal Airport. Come early though as it can get pretty crowded during season on the weekends. We really enjoyed our run at being Snowbirds for a few years but we have since settled down and been blessed with our baby girl Nora. The winter is still not our friend, hence we settled back down south in Pensacola. However it is not as warm as Sarasota so we occasionally still take trips down there in the winter to get a break from what we call cold, 50s and 60s. In addition we have downsized our transportation and no longer have the Cruisemaster. We now travel in a decked out mini van. Reminiscing about our motor home adventures is something we do often. We aim to purchase another one in a few years to travel the U.S. with Nora before she starts school. Perhaps we will go with a smaller, diesel coach like a Safari Trek. It would be just big enough to live in for a while, yet small enough to store in our driveway. There was nothing like the freedom of traveling in an RV. Home was wherever the wheels stopped. If you would like to read more of our adventures you can check out our website, www.oneshoediaries.com, where we blogged almost our entire journey for those years. You can read about interesting off-the beaten-path places that we discovered along the way. You may even pick up a tip or two about RV’ing. We wish you safe travels!